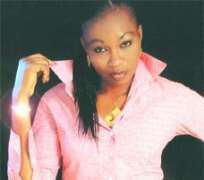 For fast rising movie star, Ehota Majiyagbe, playing prostitute in films should not make people think that she is a whore. According to the student of Yaba College of Technology, in spite of the general belief that actresses are prostitutes, she is a decent girl who is faithful to her fiance, Tayo. "I am a decent girl. Playing prostitute in a film does not make me a whore. My fiance trusts me and I am faithful to him. Tayo comes along with me to locations. He is so wonderful and a source of inspiration to me," she declared. Though, Ehota has been acting from her childhood, she actually wanted to be a broadcaster. She explained thus: "I actually wanted to be a broadcaster because I love anything that has to do with radio/TV presentation. Although, I have been acting right from my childhood I didn't see it as a career until I got to secondary school where I used to act plays with my mates. Now, I can tell you that I'm really enjoying myself." In her career spanning a few years, Ehota has featured in many films and television plays like Sound of Blood, Right Africa and others. Now with the support and encouragement of her parents, she is not looking back. Ehota pointed at star actress Liz Benson as her source of inspiration saying that she cringes anytime she sees her on TV. "Liz Benson is always natural while acting, I am captivated by the way she delivers her lines. Liz inspires me a great deal." Ehota's greatest challenge was accentuated in the yet to be released flick, Out of Blood where she plays the role of a crippled prostitute. 'It wasn't funny because I was rubbed with salt and had to go to the road side to beg for money with people casting aspersion on me. In fact, when I got the script stipulating the role, it was a great challenge for me. When the film comes out, you will know what I am talking about." she said.